This entry was posted in news and tagged press press kits on September 13, 2015 by James Day. MINI is continuing the generation change in its model program. With the latest addition to the range of the British premium brand, further target groups can now get to enjoy the distinctive MINI feeling. The new MINI Clubman, which will see its world premiere for the public at the International Motor Show 2015 in Frankfurt (IAA), is now entering the premium compact segment thanks to its increased interior space and versatility as well as its driving properties. It combines the technological advances of the latest model generation with sophisticated vehicle characteristics and numerous equipment features available in a MINI for the first time. Outstanding driving fun, distinctive and highly expressive design as well as innovative functionality further emphasise the individual style which is typical for the brand. This is what makes the new MINI Clubman so instantly appealing and an exceptional phenomenon in the face of the competition. With innovative concepts and a new level of diversity, MINI is highly successful in the premium small car segment, too. The original in this class of vehicle is enjoying increasing popularity not only as the MINI 3 door, but also as the MINI 5 door. Both models will be on display at the IAA 2015 motor show together with the latest generation of the extremely sports-oriented MINI John Cooper Works. At the world’s most important motor show, to be held from September 19th to 27th 2015, the British brand will also be presenting innovative services as part of MINI Connected in-car infotainment as well as the current range of new optional extras and Original MINI accessories which enable the customer to tailor their vehicle to suit their own personal style. The new MINI Clubman: traditional concept, unique qualities, additional engine range variety. With its four doors, the characteristic split doors at the rear, five seats and the large and versatile interior, the new MINI Clubman not only transfers the classic concept of the shooting brake to the 21st century, but also to the premium compact segment. The most recent model is also the largest one of the new MINI generation. It is 27 centimetres longer and 9 centimetres wider than the MINI 5 door, and its wheelbase is 10 centimetres larger. Its luggage compartment has a volume of 360 litres and can be extended to as much as 1250 litres by folding down the rear backrest with its 40 : 20 : 40 split. The new MINI Clubman offers the highest level of everyday practicality, long distance suitability, versatility and ride comfort ever seen in a MINI. For increased driving fun, comfort and safety, the new MINI Clubman also offers numerous features that appear in an automobile of the brand for the first time. These include the electric parking brake, the 8-speed Steptronic gearbox – optionally available depending on the model – the electrical seat adjustment function and the option MINI Yours Interior Styles with backlit door bezels. The MINI Excitement Package comprises LED interior and ambient lighting as well as a projection of the MINI logo onto the ground from the exterior mirror on the driver’s side when the car is opened and closed. Another new feature that is unique within the competitive field is the Comfort Access option including non-contact opening of the split doors at the rear. The market launch of the new MINI Clubman will be on October 31st 2015 with three engine variants, the latest generation of engines featuring MINI TwinPower Turbo Technology for sports-style temperament and outstanding efficiency. The 4-cylinder petrol engine of the MINI Cooper S Clubman mobilises 141 kW/192 hp (combined fuel consumption): 6.3 – 6.2 l/100 km; combined CO2 emissions: 147 – 144 g/km). The MINI Cooper Clubman is powered by a 3-cylinder petrol engine with 100 kW/136 hp (combined fuel consumption: 5.3 – 5.1 l/100 km; combined CO2 emissions: 123 – 118 g/km). A new member of the engine range is the 100 kW/150 hp 4-cylinder diesel engine in the MINI Cooper D Clubman (fuel consumption combined: 4.4 – 4.1 l/100 km; combined CO2 emissions: 115 – 109 g/km). The expansion of the engine range for the new MINI Clubman presented at IAA 2015 provides additional variety. An especially economic petrol engine variant follows in the MINI One Clubman (3 cylinders, 75 kW/102 hp; combined fuel consumption: 5.3 – 5.1 l/100 km; combined CO2 emissions: 124 – 119 g/km). In addition there will be two further diesel power units fitted in a MINI for the first time, with 3 and 4 cylinders respectively. The MINI One D Clubman with 85 kW/116 hp will be the entry model (fuel consumption combined: 3.9 – 3.8 l/100 km; combined CO2 emissions: 104 – 99 g/km). The MINI Cooper SD Clubman with 140 kW/190 hp (combined fuel consumption: 4.6 – 4.5 l/100 km; combined CO2 emissions: 122 – 119 g/km) will take on the role of the most powerful diesel variant (all EU test cycle figures, dependent on tyre format selected). On track for success – thanks to driving pleasure and technological progress. With the latest expansion of its model range, MINI continues to pursue its course of ongoing growth in the worldwide automobile markets. Both in the small car and the compact segment, the brand is meeting the needs and requirements of demanding target groups attracted by distinctive and highly expressive design, high-end technology and material quality as well as premium-level workmanship. With its latest model generation, MINI perpetuates the success story of the original in the premium small car segment. 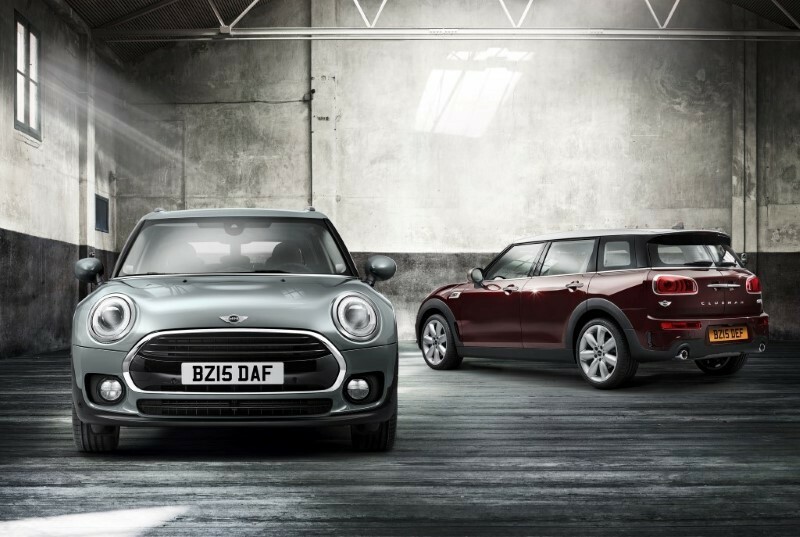 The choice of either the new MINI 3 door or the new MINI 5 door model increases overall appeal even further. The MINI Countryman already impressively demonstrated that typical MINI driving fun and individual style thrills customers beyond the small car segment, too. As the first MINI with four doors, a large tailgate and five seats, the all-rounder has greatly contributed to the brand’s continued growth since being launched. There is added support here from the avant-garde and very sports-oriented MINI Paceman, the first Sports Activity Coupé in the premium compact segment. The ALL4 all-wheel drive, specially developed for MINI, is available as an option and comes as standard in the top sports models, the MINI John Cooper Works Countryman and MINI John Cooper Works Paceman.